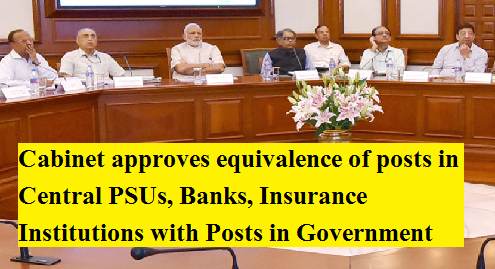 The Union Cabinet chaired by Prime Minister Shri Narendra Modi has given its approval to the norms for establishing equivalence of posts in Government and posts in PSUs, PSBs etc. for claiming benefit of OBC reservations. This addresses an issue pending for nearly 24 years. This will ensure that the children of those serving in lower categories in PSUs and other institutions can get the benefit of OBC reservations, on par with children of people serving in lower categories in Government. This will also prevent children of those in senior positions in such institutions, who, owing to absence of equivalence of posts, may have been treated as non Creamy Layer by virtue of wrong interpretation of income standards from cornering government posts reserved for OBCs and denying the genuine non creamy layer candidates a level playing field. Shri Narendra Modi has given its approval to the norms for establishing equivalence of posts in Government and posts in PSUs, PSBs etc. for claiming benefit of OBC reservations.